2100 GMT: Confirming the Show Trial. It's one sentence on a Facebook page, but it says volumes. Mohammad Ali Abtahi, cleric and former Vice President, detained soon after the June election and put on trial with more than 100 others in televised hearings last summer, wrote: "A year ago on such a day we had a trial, we had practiced the day before. What a day it was...."
The sentence has not escaped notice: there are more than 200 comments on Abtahi's page. 2055 GMT: Political Prisoner Watch. The Committee of Human Rights Reporters claims that Javad Laari, detained last autumn on charges of acting against national security, has been sentenced to death. 2045 GMT: Clerical Criticism. Ayatollah Dastgheib, a leading critic of the Government, has declared that none of the post-election arrests of political prisoners conforms with Sharia law. 2035 GMT: Jannati Watch. After much discussion, we think it's time to give Ayatollah Ahmad Jannati, the head of the Guardian Council, his own "Watch". Why? Because the growing campaign against Jannati by opposition figures is --- given Jannati's long service on the Guardian Council and his "hard-line" defence of velayat-e-faqih (clerical supremacy) --- an indirect challenge to the Supreme Leader. 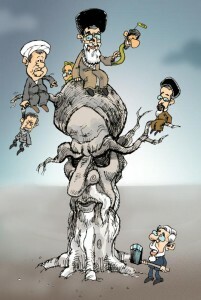 Take down Jannati and Ayatollah Khamenei's authority has been knocked down a couple of pegs. So Agence France Presse posts a valuable overview of the latest jabs at Jannati: Mir Hossein Mousavi regrets his "lying, especially when one is tasked with fostering people's votes and the constitution" and Mohammad Khatami says, "We are witnessing that they resort to lying, insults and defamation to justify oppression and bad policies." This comes on top of Mehdi Karroubi's opening salvo last week accusing Jannati of complicity in vote-stealing and Zahra Rahnavard's observation that Jannati's comments would make "a cooked chicken laugh". 2025 GMT: The Battle Within --- Ahmadinejad Sues One of the Planners? OK, having watched this story all day, let's run with it. Tabnak reports that President Ahmadinejad has filed a lawsuit against member of Parliament Ali Motahari. The charges are unspecified --- Motahari declined to comment, coyly saying, "Making this case public would only Ahmadinejad." Let's take a look. Motahari is no ordinary MP. The son of Ayatollah Morteza Motahhari, one of the key figures in the Islamic Republic until his assassination soon after the Islamic Revolution, the conservative is allied with Speaker of Parliament Ali Larijani. Indeed, he is so allied that he may have be involved in ongoing talks with Larijani, MP Ahmad Tavakoli, and Secretary of the Expediency Council Mohsen Rezaei on moves to curb the President's authority or even remove him from office. And Tabnak, which brought out the story? It's linked with...Mohsen Rezaei. 2015 GMT: Political Prisoner Watch. Ali Malihi, an officer of the alumni organisation Advar-e Tahkim Vahdat, has been sentenced to four years in prison. An appellate court has confirmed the four-year sentence of activist Amir Khosro Dalirsani. 2010 GMT: Majid Tavakoli's New Message. Daneshjoo News carries what it claims is a letter from detained student activist Majid Tavakoli: "Dictators Only Fear the Brave Who Resist". 1800 GMT: Khatami Targets the Economy. Speaking to students, former President Mohammad Khatami has taken aim at the Government's economic record, noting the lack of growth and asking, "Where has $400 billion in oil revenues over the last five years gone?" 1650 GMT: Fatwa Watch. Amidst all the rumblings over the Supreme Leader's "I am the Rule of the Prophet" declaration, Ayatollah Khamenei has received public support from one prominent figure: Tehran Mayor Mohammad-Baqer Qalibaf. 1640 GMT: Political Prisoner Watch. The detainees on hunger strike in Evin Prison --- HRANA says there are 17 --- have issued five conditions for ending their protest. 155 GMT: Mourning. Footage has been posted of the funeral of prominent Iranian singer Mohammad Nouri, with crowd singing one of Nouri's song. A video of a 2007 performance has also been put up. 1545 GMT: Protests. Rah-e-Sabz reports, from human rights activists, that there were demonstrations in Tabriz in Iranian Azerbaijan on Sunday with demands for linguistic and cultural rights. Twelve people have been arrested. 1440 GMT: A Question to the Minister. Minister of Industries and Mines Ali Akbar Mehrabian has said Iran will stop imports from countries which have imposed sanctions on Tehran: "The Islamic Republic's market will be closed to the consuming goods …of countries which prevent the entry of technology, machineries and equipment to Iran." So, Minister Mehrabian, you'll be saying "No thanks" to gasoline from Russia and China? So the President spoke this morning to the conference of Iranians from abroad (which, remember, "hardline" Keyhan has already claimed included a "CIA associate" invited by the Iranian Government). Ahmadinejad's significant statement --- that "we want a higher-level dialogue" with the US --- has already been left behind by his grandstanding follow-up that he wants to speak publicly with President Obama "one on one" in the US this September. But then Ahmadinejad takes the speech in another direction, pretty much ensuring that any importance is lost outside Iran: "Stupid Zionists" are trying to hire assassins to take him out. 1350 GMT: The Missing Lawyer. Persian2English posts the English translation of the letter from human rights lawyer Mohammad Mostafaei, still in hiding after last week's attempt to arrest him (see separate analysis), to Tehran Prosecutor General Abbas Jafari Dowlatabadi calling for the release of his wife and brother-in-law from prison. 1315 GMT: Political Prisoner Watch. Student activist Yashar Darolshafaei has been sentenced to seven years in prison. 1215 GMT: Mousavi Watch. Mir Hossein Mousavi has made a speech denouncing "religious dictatorship" as the worst form of dictatorship. The Government is hosting a conference today and tomorrow of 1200 Iranians who live abroad, hoping to bolster its image in the continuing political crisis. An opportunity for regime unity, right? Keyhan newspaper and its editor, Hossein Shariatmadari --- now entrenched in hostility towards the President and advisors like chief of staff Esfandiar Rahim-Mashai --- have denounced the cost of the gathering. It goes further to claim that one participant, Hooshang Amirahmadi of the American Iranian Council, is a "CIA associate". 1200 GMT: The Divided Hardliners. Parleman News posts a long analysis asserting that Iran's hardliners are now split into three groups: 1) those happy about the elimination of reformists and Tehran Mayor Mohammad-Baqer Qalibaf; 2) those who are irresponsible and happy about the division; 3) those like Morteza Nabavi who fear they will be eliminated like the reformists. 1005 GMT: You Can Trust Us. Amidst criticism of the Guardian Council (see 0630 GMT), its spokesman Abbas Ali Kadkhodaei has said the Council will not eliminate reformists without proof. Kadkhodaei said that an election law was necessary to clarify the Council's role and regretted that the Parliament and Government had been unwilling to compromise on a measure. "Towards the end of summer we will hopefully be [in New York] for the [United Nations] General Assembly and I will be ready for one-on-one talks with Mr Obama, in front of the media of course. We will offer our solutions for world issues to see whose solutions are better." Ahmadinejad suggested a debate last September but got no response. 0930 GMT: International Front. Foreign Minister Manouchehr Mottaki has said Iran is getting "positive" feedback from other countries, led by the US, over proposals on uranium enrichment: "We can say this process is a positive signal reflecting the political determination of the Vienna group." <0840 GMT: Parliament v. President. Front-line conservative MP and Ahmadinejad critic Ahmad Tavakoli has said the President's $1000 reward for babies must be stopped as it has to be approved by the Majlis. 0835 GMT: Jabbing at Khamenei and the President. Ayatollah Fazel Lankarani, in a meeting with the reformist Imam Khomeini Line in Golestan Province, has said that one should follow the late Ayatollah Khomeini, as he never wanted to take over power and eliminate others (take that, current Supreme Leader). He said that an Islamic Republic without clergy is impossible and noted that corruption has been successfully fought in Golestan (take that, Ahmadinejad). 0825 GMT: Corruption Watch. According to Rah-e-Sabz, President Ahmadinejad has said that his First Vice President Mohammad Reza Rahimi "has not committed a single mistake", as five officials in Gilan Province were arrested on charges of embezzlement. The news site claims that Rahimi's fraud, in connection with an insurance scandal and other manoeuvres, allegedly amounts to $700 million. 0800 GMT: Today's All-is-Well Alert. It's come early and it's come from the President, speaking to senior managers in the oil sector, "We believe that all parts related to Iran's oil industry can be produced inside the country. We hope to promise that all needs of the oil industry will be met inside Iran within the next few years." 0755 GMT: Bring Us Your Money. Parliament has instructed the Government to implement the law easing regulations for foreign banks to set up branches in Iran. 0735 GMT: We have posted an analysis by Majid Mohammadi considering "Secularists, Reformists, and 'Green Movement or Green Revolution?'" 0730 GMT: Suspending Transport. 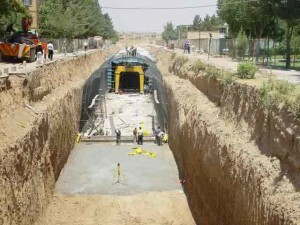 Yesterday we noted the news that German engineers working on the construction of a metro system in Isfahan were quitting, supposedly over unpaid wages. 0725 GMT: Media Shutdown. Iran's Journalists Association has issued a statement recalling the passing of a year since its members were "blacked out" by the regime. 0640 GMT: Political Prisoner Watch. Rah-e-Sabz reports that leading Mousavi advisor Alireza Beheshti Shirazi will appear in court today. 0630 GMT: Rahnavard Criticises Head of Guardians. Yesterday we updated with the one-liner from activist Zahra Rahnavard's denunciation of the head of the Guardian Council, Ayatollah Ahmad Jannati, and his recent statements: "Even a cooked chicken would laugh at his comments." 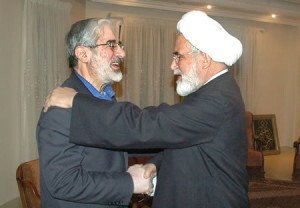 Appearing alongside her husband, Mir Hossein Mousavi, in a meeting with veterans of the Iran-Iraq War, Rahnavard restated political demands: "holding free elections without the preapproval [of the Guardian Council], eliminating the preapproval process completely from the nation's political scope, freedom of press, and unconditional release of the political prisoners". She also emphasised, "The Green Movement is a pluralist movement and belongs to all those who seek freedom and all the Iranian nation." 0525 GMT: We open this morning with news, carried on Saham News, that Mir Hossein Mousavi and Mehdi Karroubi have met. The two men criticised the Government's performance and also denounced outside threats against the country, emphasising the need for independence and national security. As for opposition tactics, the conversation appears to have been on general notions of forging "social networks". Michael Theodoulou and Maryam Sinaiee, writing in The National, offers a valuable overview of the growing conflict within the Iranian establishment, with particular focus on "hardliner" concerns: "Iran’s populist and polarising president, Mahmoud Ahmadinejad, is being accused of monopolising power, riding roughshod over parliament, mismanaging the economy and being too aggressive on foreign policy." The Committee of Human Rights Reporters writes about the alleged torture of Ahmad Baab, a Kurdish activist arrested last September. HRANA claims the father of Kurdish journalist Shooresh Golkar has been summoned by Iranian authorities and given 20 days to turn in his son. Iran Labor Report summarises the latest rise in unemployment and problems for production because of blackouts of electricity. Nikahang Kowsar: "Will Mousavi Surpass Khomeini?" Iran's official news agency announced over the week-end that it was giving full editorial discretion to the Islamic Republic's hard-line President Mahmoud Ahmadinejad over all its reporting. The Islamic Republic News Agency (IRNA) reported on Saturday that Ahmadinejad agreed to direct the agency after IRNA officials requested that the organisation be exempted from Article 44 of the Iranian Constitution, which promotes privatisation. Political Prisoner Watch: More threats against Iranian political detainees on hunger strike. Iranian detainees who have gone on hunger strikes at Evin Prison have now been threatened by the officials that they will be exiled to RejaiShahr Prison in Karaj. Didn't understand a word, Turkish or rather Azeri speaking readers please comment.